Need to find a pet friendly hotel in Virginia Beach? Click the Pet Friendly Accommodations Button below! 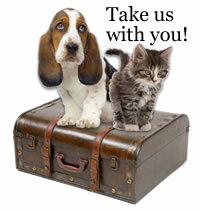 It's easy to find pet friendly hotels in Virginia Beach with PetTravel.com. Just click the SEARCH button above for a list of pet friendly hotels, motels, bed and breakfasts, small inns, and vacation rentals in Virginia Beach. If we have information for other pet friendly services in Virginia Beach, a second search button will appear that will include pet friendly beaches, parks, and other fun things to do with your pet. We welcome your emails regarding pet friendly services in your town. Just send an email to info@pettravel.com and we will add them to our database. Come back often as we are always adding new and exciting places for you to visit with your pet. Traveling Internationally with your pet? You can find pet immigration rules and passport forms for over 240 countries by visiting our Pet Immigration Information section. Traveling by Car? - We have lots of helpful hints and safety suggestions in the Pet Travel by Cars, Trains & Public Transportation section. Need a pet carrier or crate for your pet? We have airline compliant pet carriers,	IATA compliant pet crates, pet microchips, microchip scanners, and more essential items for traveling pets in the Pet Travel Store.